I’ve been thinking about fear for a scary story. Thinking about what scares me and why, what scares people I know, and why. For instance, a sister and a friend are afraid of spiders. Personally, when I find a spider I put it outside. Why are spiders frightening? Is it the way they run so fast, the fact that they have so many legs? But why are those things scary? When people talk about spiders they use words like ‘scuttle’ and ‘dart’. I think it’s the unpredictability, the feeling of being not in control. Well, my sister says spiders have hairy legs but then so does her husband and he doesn’t scare her. The same friend (I’ll let her identify herself in comments if she wishes) told me she’d be uncomfortable house sitting for us because she’d be afraid to go outside. I assume it’s the lack of any light, the surrounding woods, the wild animals. Those things that I rarely give consideration to. But this is the same friend who managed to walk a lonely road through the woods late at night with no flashlight, because she had no choice. So she has the courage to function in spite of fear. I still wonder though, what is at the root of that fear of the dark. The unknown? The unseen? This same friend lives in the city and thinks nothing of standing at a bus stop late at night. Now that would scare me. Why? Strangers, noise, crowds. And what is the root of that? Unpredictability, lack of control. Thinking more about this I realize we also fool ourselves into thinking we are safe. Like the following scenario, which happened to me. You’re in a tent on a camping trip with your husband and small child. It’s late in the season, few campers, cold at night. Your food is stored in iron ‘bear boxes’ with padlocks to keep the bears out of your food. It’s late, pitch black. You’re cozy in the tent, snug in your sleeping bag, safe. Until you hear the clanging of something banging on the bear box. And hear loud snuffling. And see the wall of the tent bulge inward. At that moment you realize that the safe ‘home’ is simply canvas material, easily ripped. And your snug sleeping bag is simply a trap you cannot get out of fast enough. Finally, you realize that by locking all your food in a bear box, the hungry bear must look elsewhere. And now you’re terrified. In our case all worked out well, of course. But what was terrifying? Again, at the very root, vulnerability, lack of control. And for me, the sudden terror that I might not be able to keep my child safe. Which could be interpreted yet again as lack of control. So in this story I’m working on, it doesn’t seem to matter what the character is afraid of so much as why they are afraid. If I figure out the why, then maybe the reader will feel that same fear. So what are you afraid of, and have you ever wondered why? 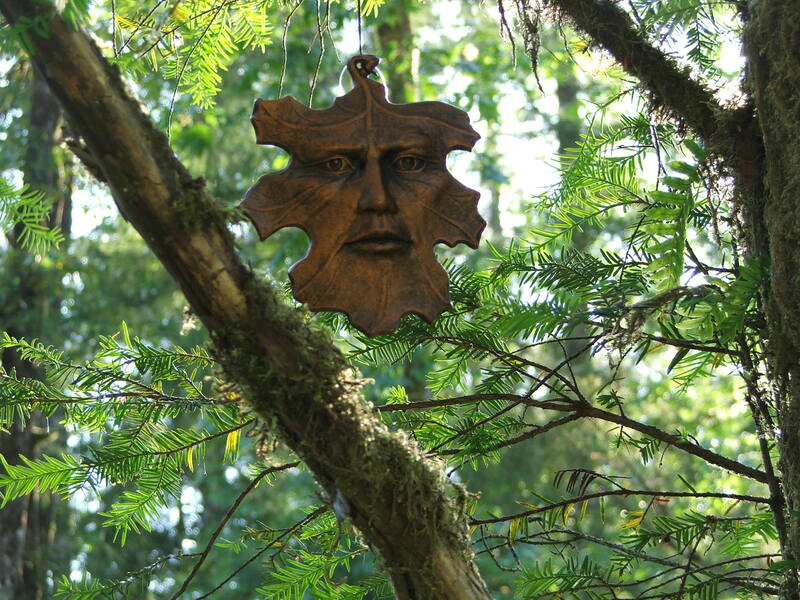 The photo below is a bronze maple leaf that hangs in a yew tree. My son says it’s creepy because the eyes ‘follow’ him when he walks by. A fear of something inanimate acting like something animate? Who knows. And okay, I added a spider for my friend. Couldn’t resist. Do the eyes follow you? 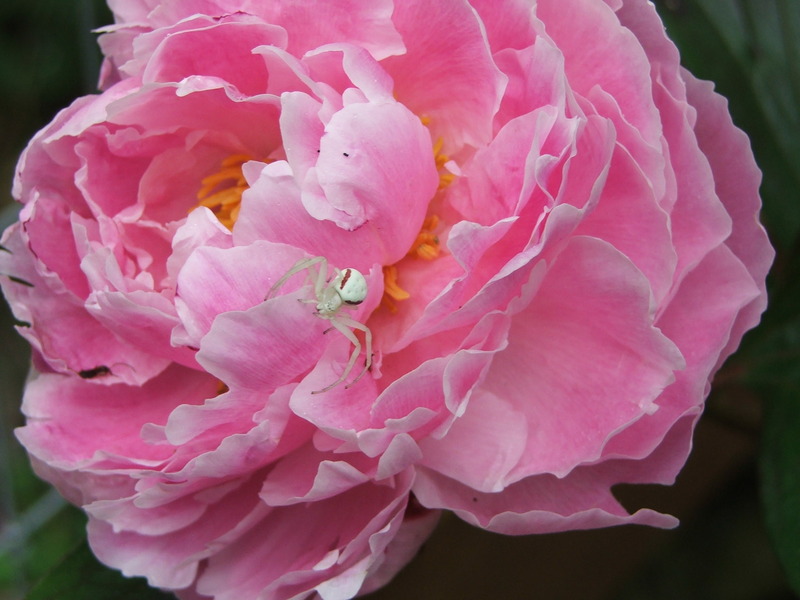 Peppermint – looking spider on a peony. I think you nailed it, Lisa. Lack of control and vulnerability. Of course there’s always things that go “BOO!” in the night. But that doesn’t have to have fear surrounding it. I’m reminded of a trick my sister and I, as children, used to play on each other (which we thought was hilarious, of course). One of us would hide around a corner in the house and when the other would walk by, we’d say, “Boo.” It didn’t have to be loud, it was just unexpected. The other person would invariably scream. Then we’d both laugh. There’s a definite “startle” factor there, and when you pair that with anticipation it can be very effective. There’s a scene in my first book (Death By a Dark Horse) that more than one person has told me made them actually jump when they read it. It’s the startle factor. Something unexpected. Oh, you reminded me here that there is also a fun side to fear, or if not fun, something we are drawn to. Otherwise, why would we willingly watch scary movies and jump out at siblings? I wonder why that is? Maybe we feel more in control of our fears if we make them into games? Maybe we feel brave if we force ourselves to be afraid and call it entertainment? Lots of new avenues to explore now! My children do this and they keep score to see who is winning. I think it is like you said that we are afraid of things we do not know how to deal with, the unknown and unpredictable and the lack of control and I would add the fear of pain. I am fine in the city, because I know my way around, but I do not know how to be prepared for a coyote, a wolf, cougar or bear. I dont know what to look or listen for, thats why I would be terrified to be at your place alone at night. I know in my heart that I will function just fine when I have to but still, the fear is there and wont go away. You know what the definition of courage is, don’t you? To be afraid and yet still able to function. Doesn’t that in itself just define you? -Are you seeking scary or creepy? Fear is such a core emotion. I would even say that fear is the oppiosite of Love, if there is such a thing. When I can stay connected to the Love that is all of us I have no fear. When I see a dog run out in the street in front of a car I am terrified. This is something I have no control over. Little Charlie is scared of the toys that seem to run themselves, yet he plays with them. He turns them on and backs away obviously afraid yet fascinated. When my cat growls in the night I find it creepy, I know that I am alright but my skin crawls any way. I carried much fear for many years and have learned to let it go and stay connected to the Love. This does not seem like a very connected explanation, but it is my thoughts upon reading your post. Oh, interesting, seeking the difference between scary and creepy. I’m going to have to put some thought into what the difference is. I’ve never thought of you as someone with fears. Matter of fact, for any readers who do not know that you are one of my sisters, remember that when I was younger, you were the one we ran to at night when we were scared or not feeling well. So even then you seemed fearless. And another thing you touch on here, that Susan above did as well, in a way, is our fascination with fear. I wonder why that is. Oooh, I think this is a really good point. Some things are scary but not creepy (like a sibling yelling, “Boo!”) or creepy but not scary (a single tarantula in an obviously unopenable tank), but scary + creepy is a really potent combination. Seems like our perception of fear evolves throughout the lifespan (like the description of Little Charlie above). I used to be less comfortable in the night, more fearful But now, like you, Lisa, I’m not afraid of the dark. I love the sensation of walking in the night, especially when the wind is active along the Wall or Heybrook ridge, it’s sort of a comforting feeling to be out there (I won’t deny that I jump if startled however). I think fear is sort of a limiting factor, a burden. And for me anyway I have to keep coming to terms with what I fear, banish it and then wait to what I find next. And we haven’t gone for a nighttime walk on Heybrook in a very long time. For those readers who remember a post about pulling our kids up a ridge in the snow at night, Sabrina is the person who hiked with me. She understands the value of solitude in the woods. What I like about this comment is that fear is seen as a normal part of our growth, that you discover your fear, come to terms with it, and move on. That in itself gives us control over the fears. and maybe by “playing” with fear we test ourselves. How much we can take, how far we can go and also to prepare and overcome some of it. Its like a controlled exposure to fear. Like when you get a shot at the doctors against something. just a little bit so our body learns to deal with it. Its like this when we watch scary movies. Love that take on it Jenni, you are so right. When I went zip lining last year, I did it to conquer my absolute fear of heights. I was terrified of “stepping off” into nothing…..air. When I did it, not just once but seven times that day I was exhausted but overwhelmed that I survived. I realized that day that fear can be as BIG or small as you want it to be. Quite the journey though. Well Kathy, for what it’s worth, I wouldn’t go on a zip line. A couple weeks ago friends invited us. The kid went, but I had to pass. There’s facing fear, and then there’s saying ‘okay, fear, you win this round’. Fear of being unable to protect myself. Fear of being unable to be a good (successful mother), fear of being medically compromised by anothers hand, fear of being a burden, fear of rejection, fear of pain. Having survived cancer, medical malfeasance, physical attacks, deprivaton from necessary medcines, and a lot of things that many others have experienced I wonder why I still can not make myself crawl under the house. Interesting. All the things you list as being afraid of, are things you have faced. The one thing you have not faced, you don’t include in your list of fears. Crawling under the house. What an interesting post. I am scared of cats. It’s ridiculous but I can’t help it. Irrational fear. I know someone like you! At least, I don’t know your degree of cat-fear, but I’ve met someone who was very scared of them. A friend of a friend. I invited them both to our house but when she heard we had a cat, this woman started shaking. But she worked up the nerve to come into the garage (where the cat doesn’t go), and was very proud of herself. Before that I never realized anyone could be so scared of them! Oh, I think irrational fear is the worst kind! Rational fear we can explain, make sense of, give reason for. But irrational fear, how do you conquer it, or come to terms with it, if there’s no rhyme or reason? I’m scared of a certain corner on the highway. I have recurring nightmares about that corner. And yet it’s not dangerous, really, there aren’t tons of accidents there. No one else seems intimidated by it as far as I know. And yet my speed drops from 60 to 30 and I creep along as far away from the rail as I can get. Geez, it’s creeping me out just writing this. I’ll probably have bad dreams tonight. Irrational fear is the strongest and most lasting. Lisa, this was a really interesting post (and I’m so glad things worked out okay with the bear!). I once had an assignment in comics class, to write a horror story. (It was an exercise in testing our boundaries.) At first I thought, oh, there is NO WAY I can do this, but when I started thinking about things that scare and horrify me, the list went on and on. I ended up writing a script that had all my classmates excited and creeped out. This story is still sitting on back burner… someday I will return to it! It will be interesting to see what you do with your scary story. Have you tried drawings of it? You seem to translate into art so well. It’s for a comic, so it’s actually meant to have drawings, but I haven’t done them yet. I don’t feel my style naturally lends itself to a scary atmosphere, so I’d have to experiment a lot to find something that works with the story! I write horror, and think about fear a lot. Fear is grounded in helplessness and a lack of control. And most of all, fear is anticipation. Remember as a child having to wait until dad got home for a whoopin’? The anticipation was always worse than the actual punishment. The anticipation lasted hours and grew. The spanking itself was over in seconds and wasn’t nearly as bad as it was built up to be. Pain has limits, imagination doesn’t. First off Mark, glad to see you! I never thought of fear as anticipation, but as soon as I read your comment I could feel it. Great insight. And keep writing those horror stories. Well, maybe pause for that dragon one…still waiting for that.